i woke up wanting something with eggs and heat. i briefly considered (boring) scrambled eggs or a (boring) omelette, but i always end up 1) forgetting the cheese until the last second, which leads to a mad scramble (pun intended) for the first cheese i see in the fridge – usually something moldy – and 2) cooking them for too long/ending up with dry, brown eggs. avocado toast with a poached egg and chile flakes crossed my mind, but i eat that pretty much every day. and then there’s the basic breakfast burrito, which is good but virtually pointless without spicy italian sausage. so i settled on this!! using a pita or naan as a base results in an effortlessly crispy crust. 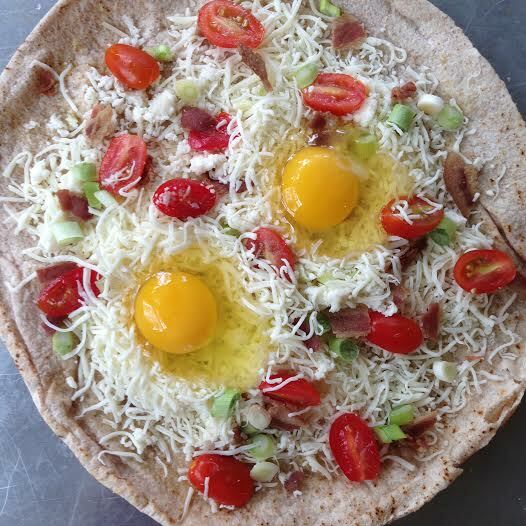 rub on some olive oil, sprinkle with equal amounts of mozzarella, queso fresco, and parmesan, dot with cherry tomatoes, spring onions, and bacon bits, and finish off with two sunny-side up eggs (yes, you can bake them right on the pizza!). the cheeses balance perfectly, and the tomatoes get super sweet when roasted. if runny yolks make you want to hurl (i’m looking at you, peg), feel free to cook the eggs separately in a pan to desired doneness. 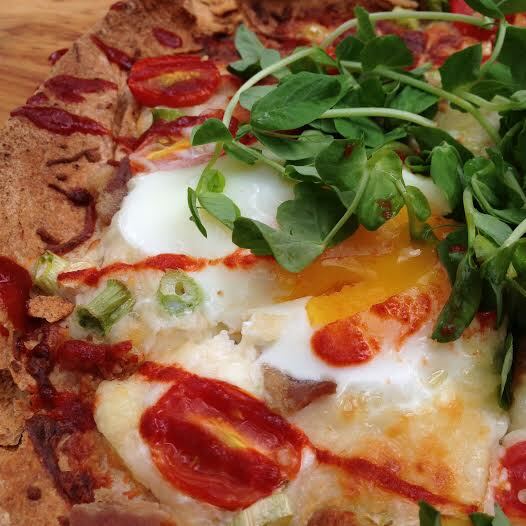 or i guess you could leave them off altogether, but eggs really make this pizza. 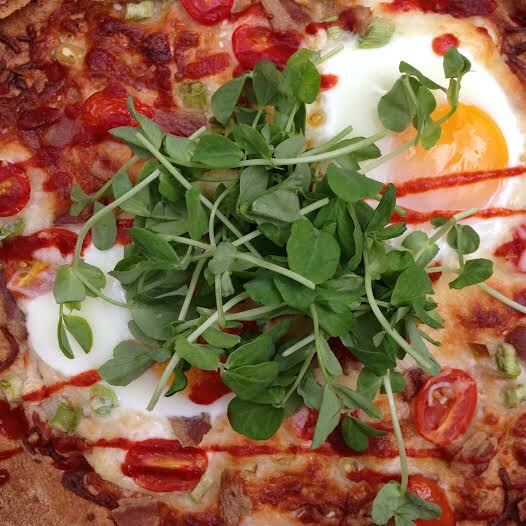 lots of local, pricey pizza parlors stick a ‘cage-free egg’ on their pizzas as an easy but unnecessary garnish. that’s not the case here. top with lots of sriracha and a handful of pea shoots. preheat oven to 350º. place the pita on a baking sheet and smear with olive oil (this is in place of tomato sauce, so be generous). sprinkle on the cheeses evenly, and top with the bacon, tomatoes, and onions. create two wells in the cheese, big enough so that you can crack in the eggs and they won’t run everywhere. top with the tomatoes and onions. bake for 10-15 minutes, or until the egg whites have set (i was doubtful at first, but they’ll set, i promise). 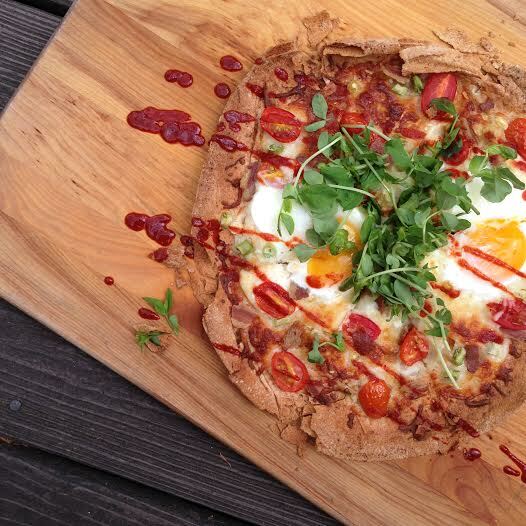 drizzle with sriracha and the shoots! brunching on this outside on a springy day is required.